This privately owned castle has baffled scientists who have been trying to research the supernatural happenings and events that have been occurring on this ancient site since the 1920s. Over the years many spooky happenings have been witnessed and reported at Mountfitchet Castle, which is not surprising considering its brutal and gruesome history. For over 3000 years many battles have been fought with thousands of lives lost on these very grounds. This Norman village contains a medieval torture chamber complete with nasty devices, therefore during the castle’s long and eventful life, awful things have happened that are bound to leave a mark…. now for the spooky bits. Clearsight Paranormal Investigations team spent an all night vigil at the Castle on 8th August 2008. Their findings were incredible; click here to read their official report. The most exciting evidence is of a ghostly apparition (pictured left) that was captured on 18th July 2010 at approximately 11.25pm and was taken inside the Grand Hall. After our night watchman had commented, on several different occasions, about feeling incredibly uncomfortable and ‘not alone’ whilst checking the vicinity of the Grand Hall it was decided to set up a time delay camera in there. Three weeks passed and the only interesting items caught on film were Orbs until 18th July when this photo was captured. This ghost has never been witnessed or recorded before and therefore a very exciting new addition to our already long list of known spirits to inhabit Mountfitchet Castle. By far the most active and haunted area within the castle walls is in the vicinity of the Grand Hall located in the Inner Bailey. Many have reported feeling a huge temperature drop and hearing faint medieval flute music, clashing of swords, voices and soft chanting presumed to be monks. Others have felt a great sense of foreboding and ‘presences’ and seeing fleeting wisps of eerie mist swirls. Most Orbs are captured on camera within this area compared to the rest of the castle grounds within the palisade walls. Many unofficial sightings have been reported of the torso of a ghostly Knight clad in chainmail and helmet always in or behind the Grand Hall, and always in the afternoon. 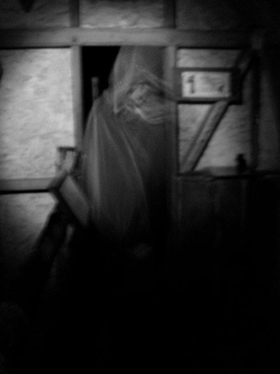 Staff members and visitors have both seen this apparition but have never felt uncomfortable during their experience with him. We also have a Monk spirit that is often felt by mediums and psychics but has also been witnessed a few times by our night staff members. Clad only in a cloak with no facial features ever seen. There is an area located between the Church and the Surgeons house the castle’s resident animals avoid and will not linger and the ground staff often feel very ‘unnerved’ whilst there. Night time vigils with cameras often capture three orbs floating in this area, always three together — one large and two smaller ones. One thing is for certain, a place such as Mountfitchet Castle with such a turbulent, tragic and macabre history, is sure to continue to provide ghostly tales and spectral sightings for a long time to come! Check out the video. Orbs are believed to be ghosts in the form of balls of light. They are life forms that travel in groups and are believed to be the human soul or life force of those that once inhabited a physical body here on earth. Ghostly orbs are the most photographed anomalies caught on film by ghost hunters and are quite photogenic (when they want to be).